Austral Buildings, 115-119 Collins Street, Melbourne. (to the extent of the land and all of the buildings shown hatched which are included in the Register Book Certificate of Title Volume 2585 Folio 869. The Austral Buildings was designed in 1890 by the noted Melbourne architect Nahum Barnet for Alexander McKinley, publisher of Melbourne Punch, and constructed in 1891 by J. and J. Baxter as shops and professional offices. The building consists of four storeys plus an attic storey and was built of red brick with cement banding. Ground floor elliptical arches support oriels on either side of a recessed central bay that features mannerist elements, the whole capped with a mansard roof. The ground floor rolled-bronze shopfronts were added in 1909 and 1929. An additional studio, the East Studio, was added probably in the 1920s. The Austral Buildings is of architectural and historical significance to the State of Victoria. The Austral Buildings is of architectural significance for its innovative design, which marks a shift from the mannerist urbanity of the 1870s and 1880s to a more picturesque and expressive style of the early decades of the 20th century. 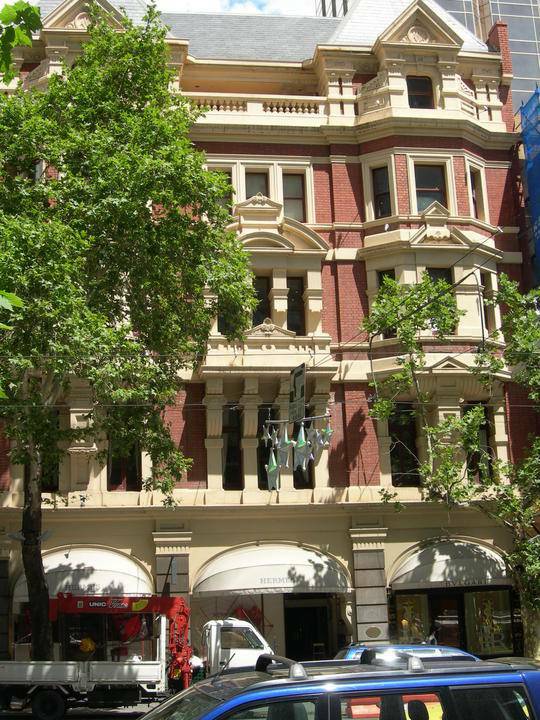 The Austral was one of the earliest examples of the English Queen Anne Revival style in Melbourne, and the use of red brick in particular was innovative and must have marked the building as very modern when it was built. The Austral Buildings is of architectural significance as an early work of Nahum Barnet (1855-1931), and displays the kind of innovation that was to make him one of the most important designers of commercial buildings in the Federation period. The composition and exposed brickwork of the facade hint at his later works, such as the Auditorium Building, and reflect his view, adopted by many other architects in the early decades of the 20th century, that materials should express the colour and harmony of nature (hence red brick rather than render or bluestone), and that designers should pay more heed to local climatic conditions, freely adapting styles rather than simply copying given styles (hence the muted eclecticism of the Austral Buildings). The Austral buildings is of historical significance as a centre for professional activity and innovation in medical, literary and artistic circles from its inception through most of the 20th century. The studios on the fourth floor were occupied by such noted artists as the photographer J.W. Lindt and the painters John Mather, Charles E. Gordon-Frazer, Leslie Wilkie and, in the 1920s, Alexander Colquhoun. During the 1890s and later the building was the headquarters of the Austral Salon, a pioneer Victorian club for women dedicated to their intellectual and artistic advancement. The Arts and Crafts society of Melbourne was reputedly formed at the Austral Buildings around 1908. The building continued to be associated with artistic circles through the Melbourne Arts League from the 1940s to the 1980s. The league, organised by the eccentric elocutionist Lorimer Johnstone, encouraged young actors and artists, arranged theatrical productions, and, during the 1950s, exhibitions by such artists as Fred Williams, Donald Friend and the late Rupert Bunny. From its earliest days the Austral Buildings was expressive of the traditional occupation of the top of Collins Street by the medical fraternity. It also had important and enduring associations with Alexander McKinley, the publisher of Melbourne punch and a Member of the Legislative Assembly. The Austral Buildings is of historical significance as a reminder of the character of inner Melbourne in the last decade of the 19th and first half of the 20th century. The diversity of its tenancies reflected a time when the CBD itself was a substantially more diverse place, with artists and theatre professionals living close to the theatres, and medical practitioners concentrated in this part of the city.